Soak the leather in a tub of water. Part of the problem is that the leather has been soaked in sweat, which is salty. You want to get the salt out of the leather before you recondition it. I usually leave the leather gloves soaking in my sink for several hours/overnight. Don't use any oils that have silicone in them. I've heard it will degrade leather over time, and I don't have any reason to believe it won't (doesn't sound like something that should be in leather). I use neatsfoot oil (which is made from the shin bones and feet of cows - using more of the animal!) and mink oil as my conditioners when I oil leather, making sure they are silicone-free (I buy them from Fiebings). Mink oil is solid at room temperature (like a paste), while neatsfoot oil is liquid. I use mink oil on my leather boots in winter (thicker oil to repel the snow and make them extra waterproof), and generally neatsfoot oil on things that don't need to be as waterproof. Some people say that animal oil products will degrade leather over time as they will go rancid, and swear by vegetable oils or "specially made for leather conditioning" products, which never tell you what is in them. Vegetables go bad just like meat goes bad, so I don't understand why vegetable-based products are better for leather (which is animal hide, anyway). And I'd rather use something that I know the ingredients of, than something I don't. Finally, neatsfoot oil has been used as a leather conditioner for centuries (it is SCA period). Take all of this with the giant grain of salt that I have done absolutely no testing on any of this - it's the kind of thing where I'd have to try and do some comparison testing over decades of use, and I'm not about to do that (and I've never seen it done, either). This is all very hand-wavy, so use whatever you think is best, because in all honesty I really don't know what's best for leather. There doesn't seem to be any really good information out about this, and none of my opinions here are based on any solid evidence. If someone has evidence-based information on this, please share! Let the leather dry for a day. If the leather is still stiff, oil the leather thoroughly again, and let dry for another day. If you don't see an improvement by now, the leather might be toast. Otherwise, repeat #5 until the leather is really soft again! I just reconditioned a pair of gloves that I thought might be goners. They were so stiff that they were highly uncomfortable to wear; they scraped my hands and crackled and pinched when I tried to make a fist in them. It took two thorough oilings, and they feel pretty darn soft now - not as soft as butter, like some leather is, but definitely comfortable to wear. They were in the loaner fencing gear for my local group, and had seen a lot of sweat and no repairing for a long time. Now they are ready to be used again! I'm amazed at how well this works. I've also done this on my own fencing gloves several times, pictured above. 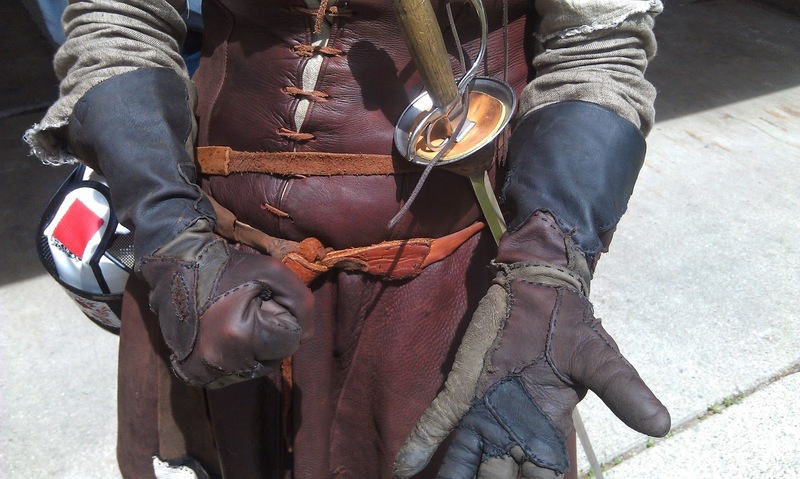 I made my own fencing gloves from leather scraps 3 years ago - they are the first piece of fencing gear I made! I adore my gloves. They fit so well that it takes me a minute to wiggle them off after I've been fencing, because the sweat makes them stick to my hands. About once a year, my gloves get noticeably stiffer and uncomfortable. I follow the above steps to desalinate and re-oil my gloves, and then they return to being super duper soft again every time.